Matcha Mylkbar, a vegan cafe in Melbourne, has cooked up one of the strangest drinks we have ever seen. This insane-looking blue latte, aptly named ‘Smurf Latte’, is actually made out of blue algae and coconut milk – the two main ingredients in this dubious creation. Before you write off this pretty blue drink as just another fad, many have actually claimed that this latte is more than decent. But is it actually worth A$8? It was just announced that both Siam Street Night Market and Ratchadamri Night Market in Bangkok will have to go. 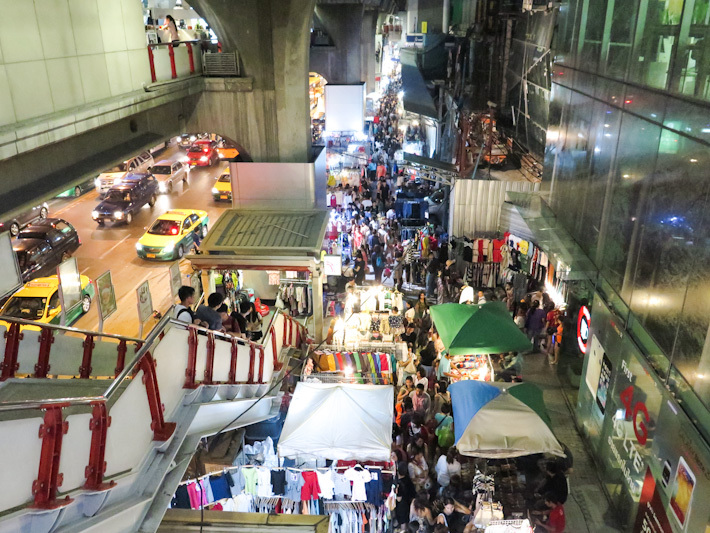 It is such a shame, because the night markets have been such an iconic sight of the Siam precinct for so many years. With all the colourful desserts and treats floating around social media, yet another one has joined the gang – galaxy donuts. Yes, these crazily beautiful donuts are real and they are now available in Singapore. Created by the owner of popular Halal-certified cafe, The Lab SG, these galaxy donuts will be sold exclusively at Sinseh: The Grocery – just a few doors down from the cafe itself. Also, these donuts can be customised to your preference! If you have specific colours or styles that you want, just walk into Sinseh: The Grocery during its opening hours to place your orders. It is true – cheese tarts are the new salted egg yolk of food trends here in Singapore because it genuinely seems like everyone is working on and introducing new cheese tart dishes. Of course, the undisputed winner – BAKE Cheese Tart – still has a special place in our hearts, but we are definitely on the look-out for more. We chanced upon Nigiro Cafe’s unique Churro Cheese Tart (S$4.80) and decided to give it a shot because it has an irresistible molten centre that just looked too good to pass up on! Nigiro Cafe is a Japanese-Italian fusion restaurant and it sits inside Eat at Seven at Suntec City. Although the restaurant might be a little to tricky to locate, our trip was so worth it and here is why. Scoop Therapy is a dessert-only spinoff of Group Therapy, serving mainly ice cream and ice cream-centric desserts. The small space sits in the East of Singapore, and you might already have seen photos of their Instagram-worthy desserts on your social media feeds. 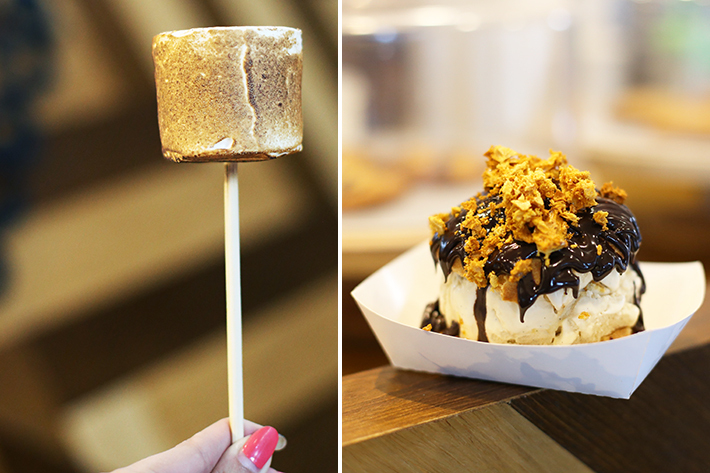 We were pretty tempted by pictures of their sultry S’mores and Ice Cream Bomb floating around social media, so we made a trip down to find out what the hype is all about. So, was the trip worth it? Our quest to find even more awesome grub this Ramadan has brought us to Tampines. The bazaar here is a lot smaller than the booths at Geylang Serai, but it still many food and drinks to offer and tempt. Some of the booths are the exact same ones at Geylang Serai, so those who live around the area need not travel all the way down to Haig Road to satisfy their cravings. A good thing to note is to visit about half an hour before or after the period of breaking fast as many of these stalls go for breaks. We scoured the entire Tampines Ramadan Bazaar to find our favourite treats. From Gula Melaka Donut Balls to Taro Jelly Bagged Drinks and Chendol Soft Serve, here are our top picks from Tampines Ramadan Bazaar 2016. It is Ramadan again! Every year, we look forward to the bazaars, and in particular, the one at Geylang Serai. Last year, we saw many creative snacks that got the nation going gaga over. And this year, we have psychedelic rainbow bagels, cloud-like cotton candy drinks and even delicious salted egg yolk sauce drizzled beautifully on freshly made churros in store for us all. Trudging through the bustling bazaar at Geylang Serai on a weekend afternoon, where 90% of the stalls are already open, it was packed with people buying some food to-go for Iftar. The stalls are all open for business and it will last all the way till early July, with most stalls ceasing operations on 05 July 2016. Here are the highlights from Ramadan Bazaar 2016. Avocados are one of the most beneficial fruits for you. They have been dubbed a SuperFood because of their superior qualities of having a lot more folate, potassium, vitamin E and magnesium than most fruits out there. Creamy, rich and all-around delicious, avocado is a favourite among many and the ways to enjoy them are aplenty! From avocado smoothies to avocado salads, avocados’ creamy texture makes it one versatile fruit, but even when eaten on its own, it is delicious. Here are 10 Health Benefits of Avocado That Will Make You Start Eating Avocados Now.